TONKAWA — Northern Oklahoma College Tonkawa hosted Northern Exposure Wednesday afternoon at the Renfro Center. Over 160 prospective students attended the college day, according to Blair Turney, High School/College Relations Coordinator. Prospective students and parents heard a number of speakers, toured the NOC Tonkawa campus and visited with various campus instructors and their programs. 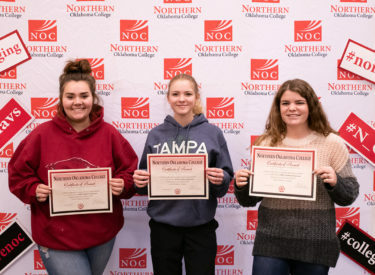 Three students received tuition waivers from NOC by random drawing. Receiving the tuition waivers were Lainie Martin, Shidler; Karisa Queen, Shidler; and Tamra Taylor, Blackwell. Schools with students attending were Shidler, Ponca City, Blackwell, Hominy, Pond Creek-Hunter, Okeene, Newkirk, Fairview, Enid, Perry, Chisholm, Frontier, Tonkawa, Deer Creek-Lamont, Alva, Woodland/Fairfax, Crescent, Perkins, Big Pasture, Pioneer Tech Center, Norman North, Medford, Morrison, and Pioneer.